This is one of the more expensive mowers on the list, but for good reason. The Husqvarna RZ3016 doesn’t have all the horse power some of the other mowers have, but it’s lighter and exceeds their top speeds. Throw in the zero-turn ability and your medium sized yard will be cut in record time. The productivity is rated at about 1.6 acres an hour. The cutting deck only has a width of 30 inches on this one. That is significantly less than some of the 46 and 54 inchers. The cutting deck is constructed with steel while the rest of the mower feels just as solid. 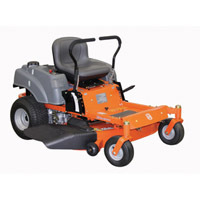 The construction quality is really good on this mower and leaves you feeling that it can get the job done. It’s a pretty costly mower at around $2,500, but it is a great performer in the yard.